I'm sure anyone reading this from the states is thinking, "Whaat? Egg tarts from KFC??" I know, I know. It's sort of strange. Actually, Kentucky Fried Chicken here doesn't even have coleslaw and mashed potatoes. Instead- it's portguese egg tarts. But they weren't half bad. Surprisingly good even. My friend brought some over when visiting and they were still warm. I think egg tarts are best eaten warm, when the flaky crust and silky yellow custard still has that melt in your mouth texture. The carmelized tops give it that creme brulee look and taste- and some of the egg tarts had red bean in them. They weren't that good the next day after being in the fridge and the crusts got all soggy. So eat them hot. And I like KFC's fried chicken too. They have original and crispy, though the crispy here is a bit spicy. So mashed potatoes and coleslaw or egg tarts? Which one would you rather have with your fried chicken? Mochi ice cream? Mochi on shaved ice? Mochi on a stick? Traditional mochi desserts? What is your favorite kind of mochi? For those of you who have never had mochi (or mua ji in Taiwanese or nien gao in Chinese), it's made from a glutinous rice and comes in many different sizes and shapes. It's probably most popularized in the states as mochi ice cream, but I remember growing up eating the brightly colored confections, dusted with white powder on special occasions when my mom would buy a box as a gift in a little shop in Gardena called Sakura-ya. The white ones filled with red bean were and still are my favorite. Or during Chinese New Year, my mom would pan fry brown sweet "nien gao" rice cakes until the outside was crispy and hot, the inside gooey and chewy. That's what this was sort of like, except on a stick. And covered in sauce. After eating dumplings near Zhongshan Hall, ice cream from Xue Wang and looking for Ah Chung Noodles, (which were a bit too mushy this time around) my friend JL and I passed by this vendor... and who wouldn't stop for mochi on a stick?! After asking what the flavors were, he recommended cheese or peanut (though I think there's also quite a few other flavors on the board behind him in Chinese). We picked peanut. He picked the sticks off the grill, squeezed some white milky sweet sauce on top and poured some ground peanuts on top. At first bite, I wasn't sure if I liked it or not, but with each bite, the flavor grows on you as you are chewing the sticky texture. Kind of like when you grill marshmallows for Smores and get that crispy outside before it burns and inside is gooey. Man, I wonder what mochi Smores would taste like! If you are looking to try some of your own, look for the Body Shop, it's right across from it, with bright red lanterns hanging from it. Kid friendliness: crowded and no high chairs spotted. Simple is hard to do. If basic "tsui jiao" or boiled dumplings were easy to make, then you'd find a lot better tasting dumpling houses all over LA. Just by looking at the picture, it's hard to taste the perfect combination of chopped cabbage, pork, sesame oil and handmade dumpling skin that made a really good dumpling. But it was really good. My friend JL insisted that we find this place that he had randomly found when he last visited Taipei about five years ago. I had my doubts, but I'm glad I trusted him. Basically, you find the entrance of Zhongshan Hall and main courtyard, turn around and look for this alley- Lane 101. And decide what you want. We only had the dumplings (10 for NT$45) because we were saving room for Ah Chung Noodle Soup inside Ximending and ice cream across the street. We ended up getting it to go since we couldn't get a seat, but saw plenty of people slurping down bowls of noodles and eating "guo tie" or fried dumplings. With nothing over NT$100 (US$3), you could feast on a little of everything for a bargain. You'll definitely spot beef noodle dumpling houses all over the city (with Chinese only menus)- probably can't pass by a block without seeing one. But if you haven't yet found what you're looking for, give this place a try. When I spotted tacos on the lunch menu at Yuma, I wanted to give them a try. So I ordered the tacos from their lunch menu at a very affordable NT$150. But I'm not crazy about the new flavor of the rice and the hard shell tacos just left me wanting to eat their regular priced fajitas Three Amigos. Bring back the original rice! Sadly, I think we'll never find the So-Cal style Mexican carnitas or carne asada tacos here in Taipei city. If anyone finds it, let me know! But my first-time-at-Yuma friends liked the vibe and the food and chowed down with their seal of approval. and drinks were in old-school glass bottles. The lunch menu is a great option, especially since you can add a bowl of soup and drink for a little extra. But if you're hungry, be sure to order off their regular menu since it's priced to share anyways. Finally, finally! I see these bright red and white tents pop up on occasion near the Shin Kong Mitsukoshi malls in Xin Yi, but I never have the time to eat there. I usually spot it after I've eaten, but this time, I saw them setting up and made a mental note to save all of my stomach to have a little sample-fest. Basically, if you like night market food, you'll like the food here. If you've never had night market food, then it's a good place for you to explore and see if there's anything you dare to eat. This vendor has probably been doing this for a long time, as he attracted customers by calling out in Chinese and flipping up his paratha like pizza dough before letting it bake on a hot, curved oven. There's even dessert options if you feel like having peanut, chocolate or butter- kind of like a crepe, I suppose. There were quite a few vendors, but this is the first one I saw. I got a mix of the two- I think abalone and chantrelle. They weren't hot off the frier, but still warm and crispy. This vendor was very efficient, wrapping multiples at a time. It was very fresh, as you can see the man making fresh skins to wrap all the vegetables and meats, and she was also stir frying the cabbage. There was quite a few different vegetables, including something pickled, so there was a crunchy as well as a soft texture; sweet from the ground peanuts as well as salty. It's not as refined as the ren bing from Shin Yeh, but just as tasty. Okay, finally stinky tofu that was tooo stinky for me. One bite and I felt sympathy for all the people who didn't enjoy stinky tofu. Probably because this was boiled and then grilled, stuffed with a bit of pickled vegetables. With two sticks, I didn't even know how to begin to shove this in my mouth, but after one pungent bite, I gave it to my friend. And a lot of other stuff like fishballs on a stick, sausages stuffed in sticky rice (yum! ), watermelon juice and squid vermicelli soup. I can't tell you when or when the street food fair happens, but sometimes you can spot them setting up Friday night or Saturday morning and they stay up through the weekend. Stop by for just a snack, or gorge on street eats the whole night for a meal. There was a whole other section I didn't get to (between A9 and A11) but last time I spotted the tents, there were quite a few carnival style games for prizes for kids and kids at heart. Happy Earth Day by the way! Where o where are you, Mr. Sweet Potato Vendor? I was so excited to see you at the busy corner with your little cart of super hot yams and take one home to try. My super huge snack was NT$60, totally worth it for the carmelized ends and roasted goodness inside. I haven't spotted you since and I feel like I'm writing one of those Craig's List ad: "You were sitting patiently waiting for customers. I regretted not buying more than one, not knowing if they were going to be really good or not, having been burned by mediocre sweet potato vendors elsewhere." I know you'll never read this, but perhaps other readers have encountered you elsewhere? I love supermarkets. Give me an hour or two at Ralphs or Bristol Farms and I'll wander aisle by aisle, usually filling the cart with stuff on sale, stuff that totally off my list. That's why I miss so many of the things I can usually find in the states- cheese (brie and pepper jack), cookie and brownie mixes, Haas avocados, Sunkist oranges, Simply Orange Juice, ice cream, candied pecans from Trader Joes.. the list goes on and on. When I'm craving things I miss back home, I'll head over to Costco but have to buy in bulk or pay premium at Jason's at 101 or Citysuper at Breeze. The trade off of shopping in a Taipei supermarket is giving up affordable American eats for affordable Chinese eats. 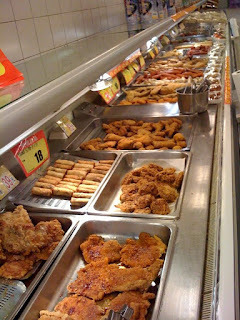 Instead of a deli counter filled with salad bars, paninis and random pasta salads, you get chinese sausages, various fried meats and cutlets, tea eggs and braised innards. Freezers filled with frozen dumplings, buns, noodles, taro ice cream and chinese frozen dinners. A fair trade? Depends on what you're craving. A few weeks ago when I just back from LA, I did some grocery shopping and was so hungry I ended up picking up some BIG sausages and pork cutlet to eat on the way home. I wouldn't get the sausage again, but the tonkatsu seasoned with the salty and sweet sauce hit the spot for my ravenous jet lagged stomach. Most of my visiting friends get a kick out of the snacks here- seaweed flavored Doritos or buffalo wing chips; various flavored chocolates and fancy Pocky sticks; drinks and jellies from Japan. What's the weirdest thing you've spotted at a Taiwan supermarket? Other locations found on their website here. Click on the phone number to get Chinese address for four other stores in Taipei and others in Taiwan. Now does anyone know where to get Bunny Peeps, lollipop sticks and edible ink pens in Taipei? I've been drooling over Bakerella's cake pops for over a year, but this is something that I could actually do! She has a million and one cute ideas and things that you will find yourself "ooh-ing" and "aahing" over. Maybe one day I'll have the courage to make one these suckers myself. Snapshot: crepes and galettes at NYNY? 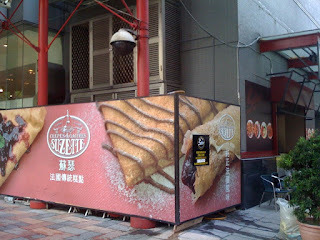 Walking around Vieshow/NY NY in Xinyi and spotted this sign.. does that mean we'll finally have soft crepes and not the hard cone-like Taiwanese crepes in Taipei? I didn't have time to check it out, but I will soon. Anyone else try it before or can recommend any good crepe places (especially since Mamm Goz closed)? Kid friendliness: lots to eat. no high chairs spotted though some room for strollers. near busy intersection though. only outside seating. These waffles were a lot more cakey than I usually like my waffles, but Louise by Aunt Stella's is a cute corner of a cafe at the Shin Kong Mitsukoshi at Zhongshan Station to catch up with a friend over cakes, especially on a nice day. I rarely get out to this part of town, but there's a lot going on on this busy street- there's also a McDonald's, Coldstones, Starbucks and Apple reseller nearby. And apparently waffles are big on this side of town. Across the street tucked in the alley, apparently there is a place called Melange Cafe that serves waffles that often has a line outside of girls waiting. Last week, I went to Hong Kong Disneyland for the first time. I had heard horror stories about people cutting in line, how it was too small and it just wasn't the same. It wasn't the same- but that's okay. And I only got cut in front of once. Other than that, it was pretty awesome. A bizzaro Disneyland if you will. There were NO lines at practically every ride- I went on two weekdays- and even though it was small, they had a lot of the main rides- Space Mountain, Dumbo Flying Elephants, Jungle Cruise, Autotopia, Mad Hatter Tea Cups. Autotopia had the longest line we waited in- half an hour. But every other ride was practically zero wait, just go to the front and hop on. You feel like you've accomplished something because you're able to check off all the rides, and you spend more time on the rides than waiting in line! Everyone at the park and hotels were exceptionally friendly. I know that's their job to be friendly, but everyone was so pleasant and helpful that it just felt really *nice* especially in contrast to the matter of fact service that you sometimes get in Asia. But what cracked me up was seeing all the Chinese food everywhere. It's too be expected since most of their visitors are gonna be Chinese. But Tomorrowland's cafe had a whole range of noodles, rice and beef noodle soups. I chose pork chop noodle soup (HKD $45) with a side of braised radishes . Even though it was put together assembly line style, it still tasted pretty good. A lot better than the awful noodle soup I had the night before at the Asiaworld Expo for the Coldplay concert- proving that just because we're in Hong Kong doesn't mean all the Asian food is going to automatically be good. If you're going to be visiting, I'd advise eating the Chinese food over the American food. I don't remember the hot dogs and burgers at Disneyland OC being that good, but not this bad either. I take that back. The corn on the cob wasn't bad. It tasted like the kind you'd get from Church's Chicken or KFC. You'd find it at the vendors, alongside dried squid and squidballs on a stick. The park closed unbelievably early at 8pm, after the firework show, so we ended up eating dinner at Crystal Lotus in Disneyland Hotel. More Chinese food, but sit down style. It wasn't bad, but of course, a lot pricier (HKD $ 318/per person for set menu). When we went we got the "Stay and Play" deal, where if you stayed at their hotel, you could buy 1 day at the park, get 1 day free. Pretty good for Disney lovers. I just checked and it's available until Sept 2009. Maximize your Disney-fied stay by catching breakfast buffet at Chef Mickey's at Hollywood Hotel and Mickey Mouse waffles, or even better, meet Mickey and the gang at the Enchanted Forest at Disneyland Hotel where they'll wander around for photo ops while you eat. The Chef Mickey's breakfast buffet had Western style breakfasts, Chinese style dim sum and noodles, Indian curries and some Japanese offerings- as well as an array of pastries, fruit and juices. I sort of expected to see more food in Disney shapes, but the waffles were the only one. On the last day, I found a little to-go cafeteria shop in the back of Hollywood Hotel where you could get sandwiches, hot plates and tiramisu with the mouse ears. I don't know how it tasted, but it's amazing that just the shape of it makes it so cute and recognizable.